Sony's FS7 is an awesome camera that can take anything you can throw at it. Perfect for many situations from more run and gun shoots to heavier documentary setups to drama and more. Can shoot 4k at up to 60 fps or 180fps in 1080P Full HD for some awesome slo-mo. It handles really well in low light with some fast lenses and is a true work horse. It really does make some beautiful images. Ours comes with a Metabones Speedbooster so that you attach your EF Lenses should you wish too. Works beautifully with our set of Zeiss CP2 lenses below. The Godfather of all gimbals - The Movi M15. Made in the USA by Freefly - this is the top of the range gimbal and it can support the Red Epic, Arri Alexa Mini, Sony Fs7 with nice cinema lenses anything up to 15lbs (6.8 Kg) Available for wet or dry hire. 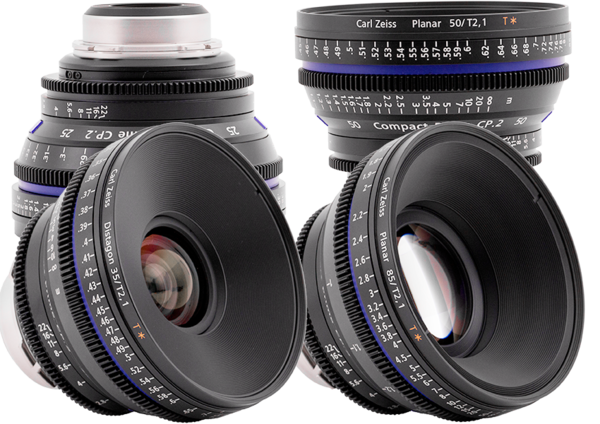 The Zeiss CP2's are in a league of their own. An industry standard - they are loved the world over for giving the beautiful cinematic Zeiss look. We love our CP2's, we look after them and they look after us in return. In our 4 Lens set we have a 25mm, 35mm, 50mm and our personal favourite the 85mm. If you would like them with another mount then we can change the mount to fit your specific camera. Made in the USA by Flanders Scientific the CM171 is an awesome 10 bit grading panel. It is 17 inches across inches and Full HD so it great to have on location in video village or in the Studio. It is fully calibrated and comes a Blackmagic Design Thunderbolt Ultra Studio Express to be able to get a true video signal out of your computer. It has two video in channels so you can view 2 sources at the same time on the one monitor as well. The Mavic 2 Pro drone captures 10 bit log footage and creates some absolutely stunning images. Keep an eye out for our upcoming drone reel! Our trusty FSB 8 is a perfect tripod. Beautifully smooth pans and tilts and sturdy enough to take really heavy loads it really can take a beating before you notice any deterioration in your shot.